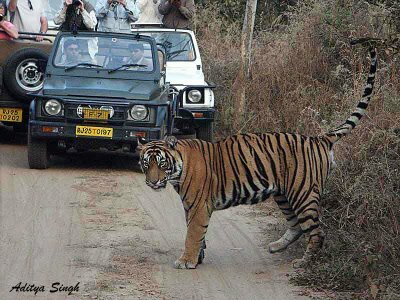 By the second week of January 2005, the Tiger watch team had started working on a presen-tation to highlight what they thought was wrong with the Ranthambore national park. They wanted to show this on a seminar of “WWF India” , which was to be held on 27th January in Delhi. The problems that they wanted to highlight were mainly Habitat destruction that was going on around the tiger reserve and the “missing tigers” of Ranthambore. 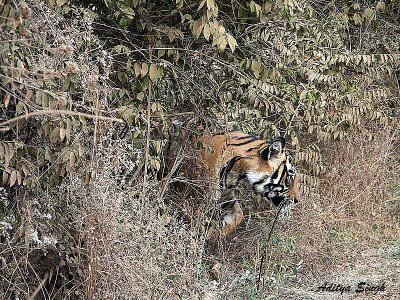 At that point in time, we knew that many tigers of Ranthambhore were missing but we were not sure what had happened to them and how did they go missing. We were not even sure how many tigers were missing. Tiger watch claimed that there were 18 tigers missing but I do not think that even they were sure about it. I did know for a fact that we could easily identify 24 dif-ferent tigers, when we were working on a film project (which came to an end in May 2002) for BBC. By the early 2005, only 6 of these 24 were still around. That makes it “at least”18 and not just 18. On the 27th January we headed out after sunset for our first job. There 5 volunteers – Dharmendra Khandal (a Field Biologist), Ashlesh Sharma and Hemraj Meena (both are nature guides that take tourists to the park), Vakil Mohammed (a tourist safari jeep owner-driver) and I. We were to meet 3 forest guards in the Bodal chowki and work as per their instruc-tions. The guards told us that we were to go to a point on the Mansarovar Road (Mansarovar is a large lake at the edge of the park) and set up a road-block there to “look for suspected poacher.” We did not think that this was a great idea but we went along with them anyways. Why did we think that this was not a good idea? Because setting up a road-block to nab poachers is a bit like throwing a baited fishing line in the Loch Ness and hoping that the monster will grab it. If the poachers were so stupid then most of them would have been caught by now. We did set up a road-block but soon got bored of hanging around there. Va-kil was the first one out of us to express that he had come out to catch poachers and not for conducting a traffic survey. He had some information about a suspected poacher (I would not name him because he is still at large) coming to small village near Khandar (a small town on the northeast edge of the park – from where Vakil hails). We decided to go there and try to nab him. One of three guards decided to accompany us while the other two de-cided to stay at the road-block and off we went to Khandar in my brand new jeep. Only when we reached the outskirts of the village did we realize what we were getting into. Half the male population of the village had a criminal record and if they ever realized that we had no back up they would have beaten the living day lights out of us. We decided to pretend that we were some special police and had a lot of back up. Most of us wear military jackets etc so we could pass of as some special police group. We parked the jeep a slight distance away from the village and entered the village. We did not find the guy we had come for but we did find his grown up son who was just beginning to cook a few partridges (game birds that are protected by the Indian law). We grabbed the guy and whatever evidence we could gather fast – like the cooking pot with the meat in it, a knife and an axe that were covered with blood, some turtle shells etc – and tried to take the guy to the jeep. That’s when the entire village (about a dozen houses) came out of their houses and surrounded us. There was a lot of screaming and shouting and we were playing the part of special police force so well that all of them still think that they were raided by a special force. The villagers stayed with us all the way to the jeep but neither tried to stop us nor did they try to touch us. They just kept staring at us. We got the guy we had caught inside the jeep and got out of there fast. We took this guy to the Khandar range of the Ranthambore national park and handed him over to the Range officer with whatever evidence that we had gathered – which was enough to put him behind bars for a few months. That was the end of our operation and we headed home. The next day we learnt that the Range Officer had discarded the turtle shells as evidence ( and legally they would have been the most incriminating). As a result the case was very weak and the guy got bail from the courts immediately. So much for our first raid to save Ranthambhore.